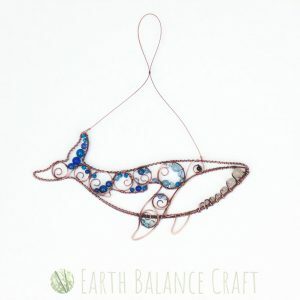 This pretty copper wire work suncatcher pays homage to the blue whale, known as a gentle giant. The designs follows his beautiful contours and adorns his body with blue and white semi-precious gemstones and Czech glass beads. The blue whale is the largest animal to live on our planet and is an endangered species on the ‘Red List’ of the World Conservation Union. He is such a majestic and graceful sea creature, eating the smallest of shrimp in the ocean in the deep blue sea. This sparkly decoration would love to live in a sunny window or out on a sheltered patio, bringing the ocean to life through copper wire art. This vibrant green hanging mobile is inspired by the gorgeous colours of the deep blue sea, the beauty of the swirling tide and sea waves. The hanging droplets are made from rectangle copper sheet, that have been layered with a textured verdigris patina. The colour palette runs through a greeny blue turquoise palette, reflecting the tones of the ocean. 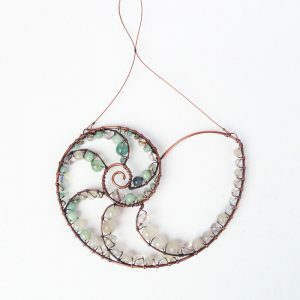 An ocean inspired geometric suncatcher with watery green and blue semi-precious gemstones; fluorite, labradorite, prehnite and quartz. 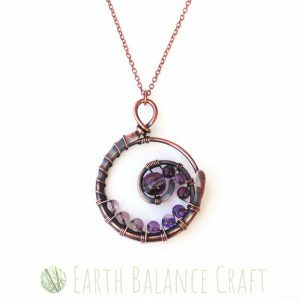 This design features pretty sea bubbles, playing with circular shapes and negative space. 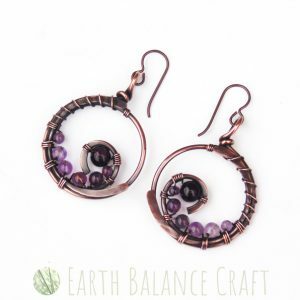 Each circle is wire wrapped with translucent beads that adore the sunshine. Best served with a dose of summer sun as a sparkling window decoration or as outdoor metal garden art.